To lay down a wreath so that no one forgets. 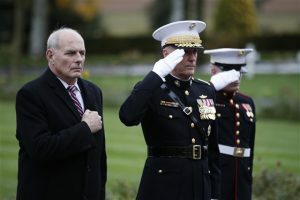 So Trump sent John Kelly along with regrets. He apparently attended a dressing down by Macron in the rain. But I guess the real problem was that there wasn't a commemoration for military academy supply sgts. "If ye break faith with us who die,"
I guess we'll find out now, won't we? The torch must be too heavy for him to hold high. Sad.